I've made it no mystery that my skin has been less than perfect in the past. Okay, it was I'm hiding under the duvet and crying all day bad. My teen years were filled with just rinsing my skin, and being good to go, once I turned 20 I suddenly felt hideous and ridden with spots. I drink enough water to practically be a mermaid, I eat a mostly green diet, do yoga a couple of times a week, and jump on the bike for some spinning twice a week, I take my probiotics, and have positivity flowing out of my eyeballs. What was the problem? This is when the obsessive Googling ensued. I cleanse morning and night, I don't believe everyone needs to but I also believe that there is a reason why we must wash our sheets. Yeah, ew. Since December I've been using this one, which leaves my skin fresh without being tight, stripped, or dry. Pat my face dry, and then I'm on to put on my serums. Vitamin C loves bare, clean skin, so that is exactly where I put it. Vitamin C is packed with antioxidants, helps diminish those nasty hyperpigmentation marks left behind, and leaves your face brighter overall! Speaking of brightening, next up is my exfoliant. If you dozed off, snap back, because this is the most important part. For ages I thought that the word acid in skincare sounded scary, and my poor, precious skin was too sensitive for it. Boy, was I wrong. My skin absolutely adores an AHA (alpha-hydroxy acid)! I use the gel version, apply it atop my vitamin C serum, and it aids in unsticking the top layer of gunk that is on my skin, removing dead skin cells that clog pores, and increases cell turnover for plumper, more radiant skin. You'll love this! I have an entire video all on exfoliants explained. Next up, moisturizer. I need something to hydrate, yet leave me shine free. This for a moisturizer followed by this sunscreen, has been perfect for that; it absorbs quickly, doesn't leave a greasy film, and even contains protection from the sun. I am a major advocate of daily sun protection, why bother with any skin care at all if you're going to just let the sun damage your skin anyways. Do it daily, and encourage everyone around you to do it as well. Show them this terrifying video if they still refuse! Don't forget to apply a lip balm with some sort of SPF as well, you can thank me in a few decades when you're still an utter babe! I used to roll my eyes at people who said "listen to your skin", but now I get it. I march up to the mirror, stick my face out like a curious turtle and just look. Look, don't pick, don't touch, just look. Feeling a little tight today? Lay off on the exfoliants for a day or two. Clogged pores around the hairline? Start taking a toner to that to remove excess hair product. Dull or ghostly looking? Slap on some vitamin C serum. The more you look, the better you'll become at giving your skin what it needs. Have you ever given Paula's Choice a go? Did I mention that they are free of fragrance and dyes, are never tested on animals, and made stateside? 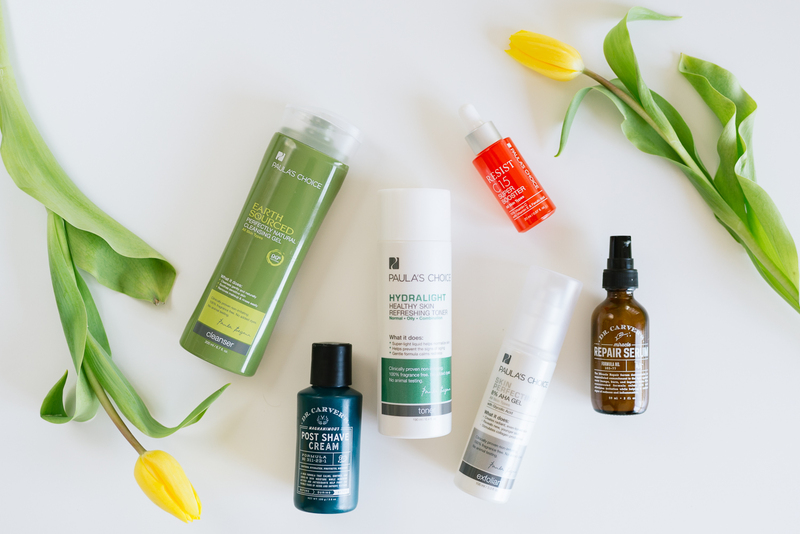 They are rather quickly turning in to one of my favorite skincare brands, and one that I'm constantly recommending to friends and family! If you want to know even more, be sure to watch my skincare routine videos!